Today is the celebration of Mary's presentation in Jerusalem, which has been celebrated since the sixth century. Today's memorial is not the same as Jesus' Presentation in the Temple. A church was built over the place of her Presentation centuries ago. Although this feast disappeared from the liturgical calendar at times, it became a feast of the universal Church in the 16th century. One reads about Mary's presentation in the temple only in apocryphal literature. The Protoevangelium of James states that Mary was offered by Anna and Joachim to God in the Temple when she was three years old. This action was to carry out Anna's promise to God that Anna made when she was childless. 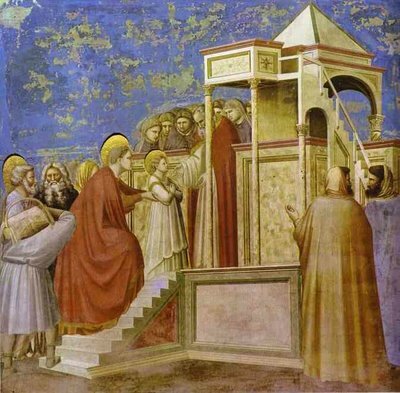 It is reasonable to assume that Our Lady entered the Temple at that young age with the words of Psalm 83 in her heart: "How lovely are Thy tabernacles, O Lord of hosts; my soul longeth and fainteth for the courts of the Lord" (Ps 83:1,2). "Hail, holy throne of God, divine sanctuary, house of glory, jewel most fair, chosen treasure house, and mercy seat for the whole world, heaven showing forth the glory of God. Purest Virgin, worthy of all praise, sanctuary dedicated to God and raised above all human condition, virgin soil, unplowed field, flourishing vine, fountain pouring out waters, virgin bearing a child, mother without knowing man, hidden treasure of innocence, ornament of sanctity, by your most acceptable prayers, strong with the authority of motherhood, to our Lord and God, Creator of all, your Son who was born of you without a father, steer the ship of the Church and bring it to a quiet harbor"
O God, Who didst will that this day the ever blessed Virgin Mary, dwelling-place of the Holy Ghost, should be presented in the temple: grant, we beseech Thee, that through her intercession, we may be worthy to be presented in the temple of Thy glory. Through our Lord.